Most hen & chickens ferns in cultivation are the false hen & chickens fern, Asplenium ×lucrosum, rather than Asplenium bulbiferum. The two are easily distinguished. Asplenium ×lucrosum is a sterile hybrid between Asplenium bulbiferum and Asplenium dimorphum. The “×” preceding “lucrosum” indicates it is a hybrid. Fronds with (left) and without (right) spore-producing structures, of the same individual of Asplenium ×lucrosum. Asplenium ×lucrosum inherited this frond dimorphism (having two forms) from Norfolk Island’s Asplenium dimorphum. Photo by Leon Perrie, Curator. (c) Museum of New Zealand Te Papa Tongarewa. Bulbils (‘chickens’) of Asplenium ×lucrosum. Asplenium ×lucrosum inherited the production of bulbils from New Zealand’s Asplenium bulbiferum. This part of the frond is trying to make spores, and is consequently narrowly dissected. In this image the spore-producing structures are just visible as orange lines poking out from the underside of the frond. Photo by Leon Perrie, Curator. (c) Museum of New Zealand Te Papa Tongarewa. 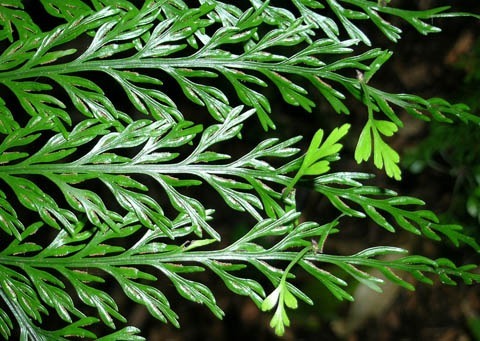 The two parent species – Asplenium bulbiferum and Asplenium dimorphum – don’t occur together naturally, Asplenium bulbiferum being naturally found only in New Zealand and Asplenium dimorphum only on Norfolk Island. However, by 1831 both had been taken to grow in Britain. This is probably where they hybridised, producing Asplenium ×lucrosum, which is now cultivated around the world. 1831 was when Allan Cunningham returned to England from his botanical explorations in Australasia; he is one of the few botanists to have visited both Norfolk Island and New Zealand by that early time. We know from his writings that he sent home live plants of Asplenium dimorphum. We also know that he collected Asplenium bulbiferum, and he may well have been responsible for its live export too. Like many hybrids, the false hen & chickens fern is unable to reproduce sexually, its spores being abnormally formed. However, it can be propagated vegetatively via its bulbils. This is how it is produced for sale, and also how it has become a minor weed in some parts of New Zealand. Perhaps because it has ‘hybrid vigour’ and is easier to grow, Asplenium ×lucrosum is the hen & chickens fern usually sold. The name “lucrosum” reflects its lucrative cultivation for horticulturalists dealing in ferns. Te Papa’s herbarium holds the type specimen of Asplenium ×lucrosum, images of which are available via Te Papa’s Collections Online. Perrie LR, Shepherd LD, Brownsey PJ. 2005. Asplenium ×lucrosum nothosp. nov.: a sterile hybrid widely and erroneously cultivated as “Asplenium bulbiferum”. Plant Systematics and Evolution 250: 243-257. Am I correct in thinking that A. Xlucrosam forms bulbets only along the rachis, whereas A bulbiferum produces them all over the foliage? Asplenium x lucrosum produced bulbils all over the foliage too. 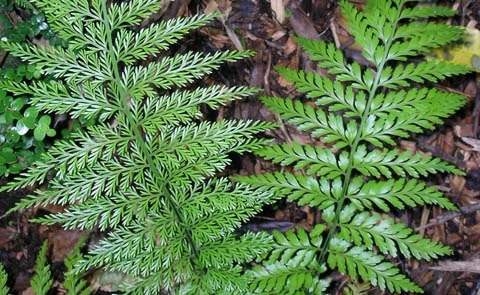 Te Papa's Blog | Is your hen and chickens fern a fake?